The first time I recall hearing about Niso Shacham was at Kfar Maimom when, with as much vulgarity as you can imagine, he gave orders to his policemen to use excessive violence against the unarmed civilians protesting against the evil order to expel all the Jews from Gush Katif. Seven years later, almost to the day, Niso Shacham has been given leave from the police due to the investigation against him. Perhaps it should have been obvious to those above him that someone who could speak so disgustingly, so sexually violent, that he may also be personally acting out against others in the same manner as he was speaking and telling his subordinates to act. Who else knew about him should also be investigated. According to the reports, Shacham had possibly been harassing and assaulting policewomen under his command, including “illicit relations” – it not clear to me if that means consensual or not, but since they were under his command, that’s already a problem. Furthermore, another of his subordinates was allegedly involved in covering up the complaints. Since Gush Katif, we’ve been hearing ‘Yesh Din v’Yesh Dayan’, as one official after another, connected to the Expulsion has been taken down for some illegal or immoral act or another. Here at the Muqata we pointed something out a long time ago. It’s no accident that these people are all getting caught doing dirty deeds or not acting in a manner befitting their position. The fact that they had no moral problem kicking out thousands of Jews from their homes already told us they had no morals. What we’re just seeing now is them getting caught in other areas which doesn’t happen to involve Settlers. Yesh Din v’Yesh Dayan - there is Judgement and there is a Judge, but it's their own fault. There’s no question that Chareidi (ultra-Orthodox) society in Israel has a serious problem, and that Israeli society as a whole will have a serious problem because of the Chareidim. But, the problem is not that most Chareidim don’t serve in the IDF. The problem is their minimal participation in the workforce, and the unsustainable growing financial burden that this is placing on both the Chareidi family and on the rest of the country. Baruch Hashem, Chareidim have large Jewish families, but they are also the poorest sector in Israeli society (along with the Arabs). The reason they are poor is both legal and societal. Most don’t want/can’t join the IDF (for a number of reasons, some valid, some not - and that isn't the point of the discussion here). But because they don’t serve, they also can’t work, as Israeli law doesn’t permit them to. So they are instead trapped in a situation they can't get out of. Unfortunately, many of those screaming the loudest for forced Chareidi inclusion in the army are not doing so in order that the Chareidim can join the workforce. They aren’t doing it for “equality” or "societal justice" (otherwise they’d be just as vocal and immediate about the Arabs and the Leftwing pacifists that don’t serve). And they aren't doing it because it's about what's good for Israeli society. Instead, they are doing it because they see this as way to attack Chareidi society in a way they hope will break down Chareidi walls and religion. And worse, some see this as a form of revenge on a group they hate. (Sound familiar?). Meanwhile, in their own self-serving way, the Chareidi newspapers are reporting more and more stories about Chareidim who served (and are serving) who are being insulted and attacked on buses and public places for "not doing service". They are reporting more stories about secular Israelis telling them how IDF integration will be their revenge. Undoubtedly, the stories, while probably marginal, are true, but they just succeed in making the Chareidim entrench themselves even deeper against the assault. It’s witch-hunt season again, but instead of Settlers, it’s Chareidim. In one form, or another, the government is going to probably pass a law that will ultimately force Chareidim into the army, but like in Gush Katif, is the government addressing the real problem? Is the government prepared for the day after? Is the army prepared to handle so many Chareidim and their special requirements? The answer is no, just like the government wasn’t prepared to handle the 10,000 homeless Settlers it stupidly created overnight. And Israeli society certainly isn’t prepared for the time when the Chariedim will start to follow the path of the Settlers who now make up more than half the combat officers. They’ll start to complain about that too, how the Chareidim have stolen their army away from them. There is no easy solution here, but the first step must be an honest explanation of the goals. Social engineering is not a good short term goal. 'Equality' is not a good short term goal (especially when it isn't being equally applied). If the government wants to solve the real problem, perhaps the first thing it should do is tackle getting the Chareidim into the workforce immediately – without the army, while offering benefits to those who join, while only a few years from now start requiring a universal draft (or getting rid of the draft entirely and creating a professional army). Not fair to those of us who have served or are serving? Lots of things in life aren’t fair, but anyone who thinks you can suddenly force an entire society to turn on a dime is fooling themselves and looking for disaster. Once the Chareidim begin working, it will eventually follow that they will want to join the army too when they see the tax benefits they would be otherwise getting (for instance). But the way things look to me right now - it just reminds me of the Gush Katif Expulsion– and many of the motivations and decisions that were behind that fiasco. Ultimately not only were the targeted Settlers badly hurt, but a significant portion of the rest of the country has had to pay the price for that short-sighted (and underhanded) thinking. Last week, a German court felt brazen enough to declare that Bris Milah, religious circumcision is against German law. Yesterday, the Jewish Hospital in Berlin (not really a Jewish hospital) suspended all religious circumcisions. 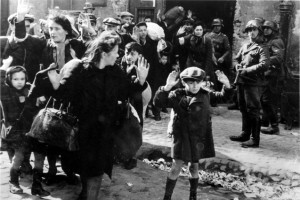 Since the Shoah, Germany had the [fill in the word] to suppress their anti-Semitism. But now it seems that whatever it is that controlled it, has begun to wear off. Some people claim that this is the action of one judge, and just one hospital just following orders. Because besides a token German minister or two saying something, we should be seeing major public acts of contrition on the part of Germany in the face of this most blatant of anti-Semitic acts. And we're not seeing it. If this upsets you, as much as it upsets me, then sign this petition. The Jewish Press will be sending it to the German Embassy in Israel, so they can hear from the Jewish People that we don't accept their anti-Semitism, and they have "no moral or ethical right to pass any laws or make any statements regarding Brit Milah (circumcision) or on any other Jewish practice." Children's paper Otiyot recently ran the following comics, part of a time-travel story series. Tel Aviv, end of the 19th century. Waiter: How's the Hebrew dictionary coming along, Mr. Ben Yehuda? Ben Yehuda: Fine, Gershon. Do you have an idea for a word to call for help? There is one factual error and two conceptual errors in this comic. Can you spot the historical errors?